If you find yourself with a runny nose, itchy eyes or more asthma symptoms around the holidays, it may be due to allergies, and not to a cold. Both real and artificial Christmas trees can cause allergic reactions, and can be mild to just plain dangerous. There is a distinct uptick in visits to the hospital for respiratory problems during the holidays. Real Christmas trees spend years outside where they collect air born pollens, herbicides, fertilizers, and molds that cling to the needles. Dragging them in and out of the house and placing lights and decorations can release these allergens. Molds can grow over the time, so you should consider getting a freshly cut tree, and hosing it down to reduce the amount of allergens released from the tree. Artificial trees can be no better. They too can harbor mold and dust that are stirred up when set up. Unless they are kept in a dry, dust-free environment, you will need to wipe them down with a damp cloth to remove noxious substances. After Christmas, put it in an airtight plastic bag and keep it in a cool, dry place (as opposed to a damp basement, for example). Ornaments and lights should also be cleaned prior to use – like the artificial tree, they too can bring in dust and molds.Likewise, they should be stored in a dry area, off the floor and in plastic bags or containers. Even with all these precautions, some people will still be symptomatic. Be sure to have a supply of Pepex handy! 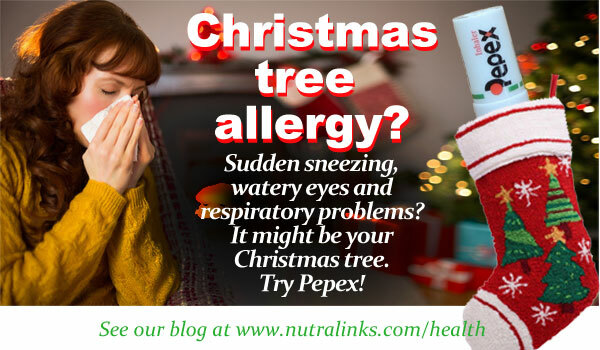 A great stocking stuffer, Pepex helps deal with much of the sneezing, watery eyes and respiratory issues associated with your tree and keeps the season merry!